Mild stroke, known medically as a transient ischemic attack (TIA) occurs when the intake of oxygen to certain parts of the brain was blocked for a while, then returned to normal. 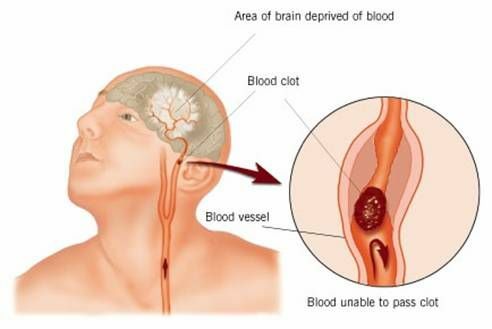 Obstruction is usually caused by narrowing of the arteries of the brain due to atherosclerosis or small blood clots brought in from elsewhere in the body and block the arteries of the brain. Most strokes lasted less than ten minutes with a temporary phenomenon. Some other mild stroke last up to several hours. When it lasts more than 24 hours then it is classified as usual stroke. When you experience the above symptoms, you should immediately see a doctor. Minor stroke is a threat and an opportunity for you. Called threat as a warning of the risk of stroke in the future. Called opportunity because you have a chance to prevent it. In addition to examining the symptoms, the doctor will ask your medical history, including if you have a risk of stroke due to high blood pressure, diabetes, high cholesterol, smoking and certain heart diseases. Physical examination included a neurological examination to evaluate the level of consciousness, sensation, and function (visual, motor, language) and determine the cause, location, and level of stroke. Your doctor will evaluate the airway, breathing and circulation and vital signs (ie, pulse, respiration, body temperature). Head (including ears, eyes, nose, and throat) and extremities were also examined to help determine the cause of the stroke and rule out other conditions that produce similar symptoms. To ascertain the cause of a mild stroke, your doctor may request for a CT (computed tomography) or MRI (magnetic resonance imaging) to your brain. Another examination of the condition of the heart and blood circulation using Doppler, MRA (magnetic resonance angiography) or cardiac x-ray may also be done. If you have a mild stroke, the doctor will prescribe preventive drugs to reduce the risk of blood clots recurrence of stroke, which is an anti-coagulant and anti-platelet. Aspirin is the drug most widely given to patients with post-stroke. When the arteries in your neck narrowed mean, surgery or carotid artery stent may be done to correct it.